I have been a military child for my whole life and I've lived overseas for as long as I can remember. 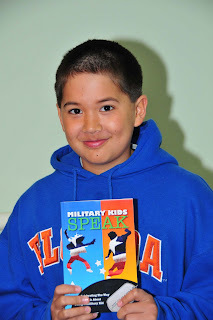 Being a military child and living overseas provides a number of opportunities, such as interaction with other military kids and host country nationals. Living overseas also provides a chance to visit historic landmarks and other interesting places. I have lived on the island of Sicily since I was five years old and have visited almost every country in Europe. Some of the things I love and love doing I would not have discovered if I wasn't a military child and had not moved to Italy. Living abroad enables military kids to develop qualities that civilian kids may not acquire as quickly. Many military kids have developed similar qualities because they are what they are—kids in military families. Qualities such as being more accepting, being more trusting, and being able to make friends and reach out to people are part of every military kid. These are just a few of the extraordinary qualities we share. I joined the Student 2 Student program at my school because I know what it is like to be new to a school, and know that it can be challenging. I want kids to feel accepted. In the Student 2 Student program, I show new students around the school and show them where important sites are, like the library, cafeteria, gym, nurse, bathrooms and their classes. I don't just show them around, I am very often one of their first friends at the school. Most kids in America do not have to move once in their life. Some military kids have to move as many as eight times before they graduate from high school. I think that moving is a speed bump not a road block. And I think that it is an opportunity for many things. Because of being a military child, I now see the world as an adventure that I can go on and learn and experience new things. I have been moving most of my life. First, I was born in Colorado and I lived there, too. I lived there until I was one year old. Then, I went to Texas. I lived there for three years. That is when my dad joined the Army. After that, I left Texas at the age of four years old on my way overseas to Germany. I liked a lot of things in Germany. It was fun in Germany. In Germany, my mom got a teaching job for DoDDS. I stayed in Germany for four years. My house in Germany was on the base. It was kind of big and I had a lot of friends. I really liked the food in Germany. It was very good. I have been a lot of places in Germany with my family. Then we moved to South Korea. I really did not feel anything when I went to South Korea because I was very young. I did not understand why we had to leave our friends. I stayed there for two years. I had two different apartments in Korea. They were very big and roomy. I liked the food in Korea, too. It was very good. Now I am in Japan. I am not sure how the food tastes, but it does not look very good. It could be good. I just have to try it. The feeling that I had when my mom told me that I was moving to Japan was happiness. However, I was going to miss my friends and the foods. It was sad telling my friends good-bye. My sister wants to go back to the States, but my mom said no. I still think about my friends in Korea and Germany. Are they still there? Do they remember or miss me? I still keep in touch with my best friends on the email. When I moved here to Japan, the movers kept on breaking our things. The day we got here in Japan, we got our cell phones. The second day we got our car. We were still house hunting then. When we found a house, it was very big and cost a lot of money. My house has four bedrooms, but the fourth one we use as a computer room. My family and I have been to three different continents. And I have visited over twenty different places in Europe and in the United States. I know people who have lived in one place and never went anywhere. I have been to many different schools and sometimes the same one. I have many different friends all over the world, too. Sometimes I like living abroad, but sometimes I do not. My life, being part of a military family, is very interesting. My home has always been overseas since my dad joined the Army. The way I feel about overseas is that at first I didn't care where we went. Then I started missing my friends and realized I cared. I am ten years old now and have been half way around the world. Since I was four years old, I have been overseas. It has been six years and I'm ready to leave. So this year, I am moving back to the United States. I am going to North Carolina for one year. Then I am going to Virginia for I don't know how long. I am happy that I am going back to something that I know. I am happy to go back with all of my family. Just being back home in America is the best feeling as long as my family is together. I have gone to school in the States before, so it is like nothing different. I will miss overseas and having to leave my friends that I made over here in Japan. Japan was fun, but very expensive. I will miss my school and everyone in it. I hope to do well at my next school and not make too much trouble for the new teacher. I will miss my old teacher, Ms. Turner. Moving is very fun, but sometimes hard on you. You have to have courage and a positive attitude when you come to a new place. Try to make the best of it. You might like that place. Give it a try.